I run a few Firefox versions, as do many of you. I just installed v61.0.2 & tried it out on a few of my "normal" sites. eg; hobbyking/avast support fora/MWP forum & my radio yachting HP all work fine. ....those details do not show up in the Privacy/Security section along with any of the other sites log in details. Also, my other versions all auto fill the log in boxes. Assistance req'd as to why.... please. I've X referenced all the settings in v57 & 61.0.2. Both the same in all respects. AFAICS. 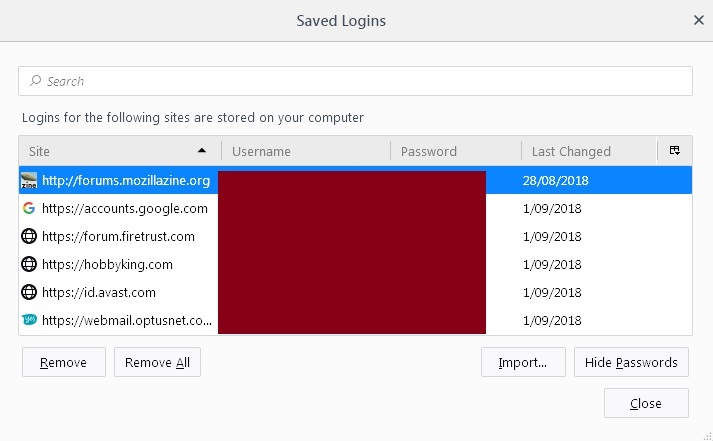 Has it saved any logins at all for you? even though I can actually log in. It's just that Firefox will not offer to save the detail or auto log in. As I posted, I can log in & save to all my other sites......Well, the ones I've tried. > eg; hobbyking/avast support fora/MWP forum & my radio yachting HP all work fine. NB: I just tried un/re-installing v61.0.2, but nothing changed. I still cannot get Firefox to ask to save my details & they do not appear in the Privacy & Security section, along with the other sites details. Cleared cookies, cache etc......run in Safe Mode.....disabled the Plug-ins.....yada yada yada....? It's got to be their "newly created site." Can't think of anything else to try, but why does it work in v57? What did "they (the new site) or mozilla" change in v61.0.2? I checked AVAST' options etc, but cannot find anything relevant that would cause just one site to fail. > security. ask_for_password.......which is set as the default = 0. > Determines when Mozilla Mail should ask for the master password. 2: Every n minutes, where n is the value in security.password_lifetime. Hi Did you try (my favorite option) "Forget about this site" right click (in history) ? Nope. That did absolutely nothing. Thank you for the suggestion. Cleared the sites cookies 'n' cache again, but nope....Still no "ask......" from v61.0.2. No probs with logging in or saving details or auto fill on this site. I just sent "them", (hobbywarehouse), a message, asking them about this error........err, problem. Welcome, does a new profile exhibit the same behavior as before? Well, you will not be pleased to note, that even a new Profile does not offer to "Ask to save....." or store the info. Excuse me, is v57 and the new profile still asking to save password on that site?? former or old login page used type="submit" button. However, current login page is using type="button" button and ajax code to send login data instead of submit. No. It's not v57 that has the problem. It's version 61.0.2 that has the problem. Still waiting on a reply from "them." I guess you check in "Exceptions..." at "Forms & Passwords"
edits: nevermind you try a new profile. Checked & double checked any/all prefs/options. Nothing will get v61.0.2 to "Ask........" or "Save......."
Interesting, even a new profile, seems to give you the same behavior Limpet235.